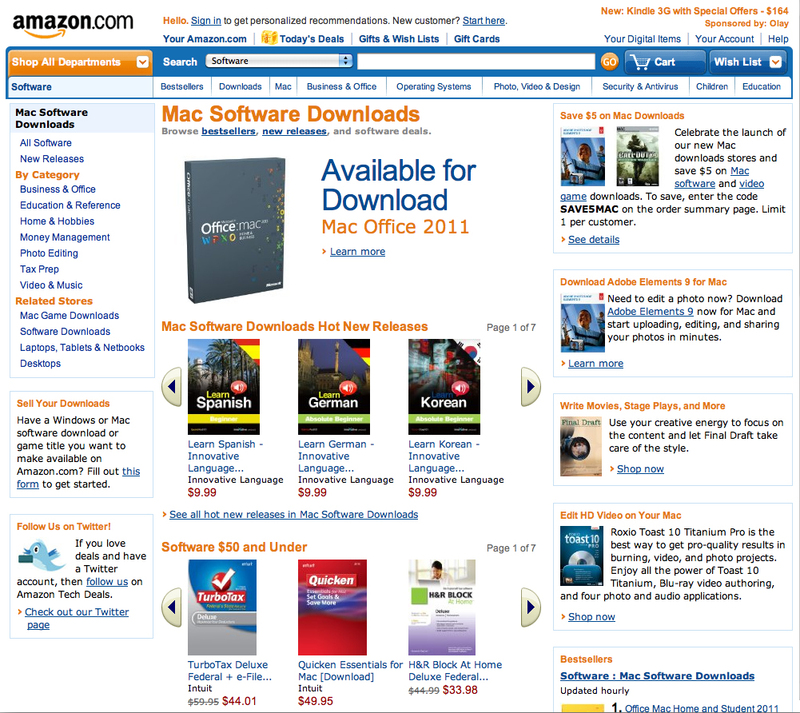 Amazon has opened a shelter for Mac software developers who either can't or don't want to sell their apps in Apple's Mac OS X Mac App Store: the logically named Mac Download Store. Amazon's offering is a direct competitor to Apple's store, which was announced along with Mac OS X Lion last October and launched in early January with over a million downloads on its first day alone. The new Mac Download Store, which is divided into sections for software and what it calls in charming retro fashion "video games" – already has one major application suite that you can't find on Apple's Mac App Store: Microsoft Office for the Mac 2011. Odds are, however, that you'll be seeing more apps appear on the Mac Download store that aren't in Apple's store. Cupertino's Mac App Store doesn't take all comers; it – in Apple's term – "curates" its wares, which much pass a series of restrictions to be allowed aboard. Some of the restrictions are more than reasonable, such as those that protect against fraud and protect privacy. Some are silly, such as "Apps that exhibit bugs will be rejected," which would, let's face it, eliminates nearly every app ever written. Some other restrictions, though are more troubling to developers, such as the prohibition of try-before-you-buy versions, a lack of an app-upgrade policy, a whole raft restrictions that Apple could use to eliminate apps that compete with its own offerings such as iLife and iWork, and more. 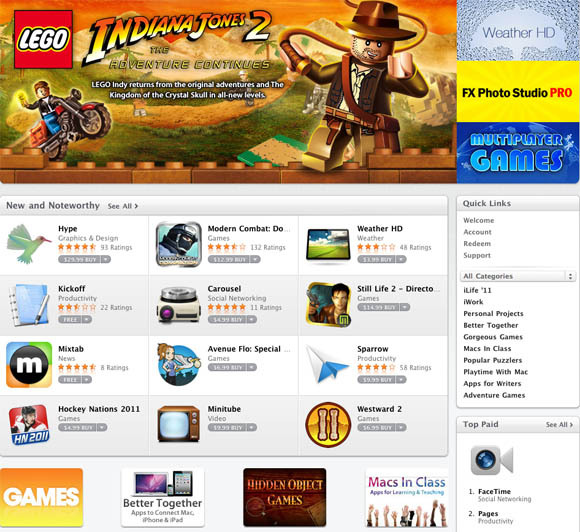 When we spoke with Mac developers about Apple's Mac App Store, we heard mixed reactions. Responses ranged from cheers that the store was the greatest thing since sliced bread, to laments that some apps could never be allowed to be sold on it, to complaints that dealing with Apple was somewhat akin to dealing with a brick wall when it came to getting information that would help a developer schedule rollouts, maintain customer contacst, and the like. Now Apple has a direct competitor – albeit a browser-based one, and not an app-based one as is the Mac App Store. It remains to be seem how much of a chunk that Amazon's Mac Download Store can bite out of Apple's store, but one thing is likely: you'll find apps on it that would never pass the Jobsian hurdles blocking acceptance into the Mac App Store.